Doth your playroom runneth over with toys? You are not alone if you find yourself suffering the post-holiday buried in toys syndrome. Take advantage of this time to do some decluttering and organizing your kiddos toys. Make room for the newly acquired toys by playing a game of lining up and counting all of the new toys. Next, have your child match each new toy up with one that is no longer being played with. An excellent opportunity for teaching your children a lesson in sharing exists here. Explain how happy some other children will be to receive the toys and how they will be new toys for the other children to play with. There are charities all across the country that collect toys for various organizations. Almost everyday Totally Kids fun furniture and toys receives new and gently used toys donated for Twin Cities families affected by Autism. If you are in the Minneapolis St. Paul area please drop off any toys that you can spare. We would like to express gratitude to all of those who have so generously donated toys over the last few years. Thank you! Here’s a spotlight on a great Autistic friendly event! Families with special needs children, looking for something to do this Saturday, September 26th? Check out the Carmike Wynnsong 15 Theater in Moundsview, Minnesota for a Sensory Friendly showing of Hotel Transylvania 2! Sensory Friendly showings are specifically made for individuals with special needs such as Autism. Often times families with Autistic children are reluctant to bring them to the theater, because when children with special needs go to the movies, they may be overwhelmed by the bright lights, loud sounds and crowds of people, many times causing a scene. At this Sensory Friendly showing, the lights will remain on and the volume of the film lowered to reduce stimuli so that individuals with special needs feel comfortable to be themselves in a theater environment. This event is a perfect chance to bring an Autistic child to enjoy the theater without fear of being themselves. There will be a coloring contest, face painting and drawings before the show. The showing starts at 10:30 a.m. so come early. For more information, view the Carmike Wynnsong 15 facebook page. Let us know of other events tailored for children and families with special needs. What an exciting day we had at Totally Kids today! We were able to meet with the founder of Pawsitivity Service Dogs. If you haven’t heard of this nonprofit before, we highly recommend that you take some time to read their About Us page. 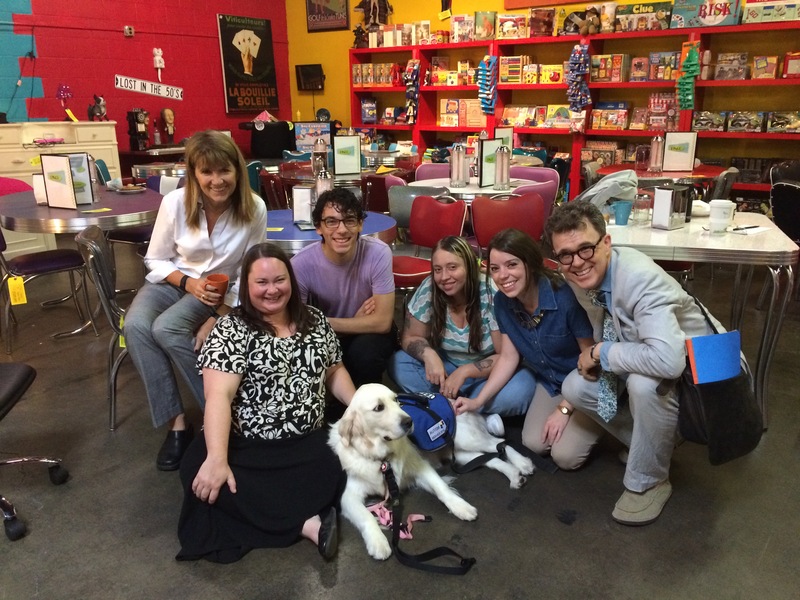 Tom and Julie Coleman founded Pawsitivity Service Dogs four years ago. Their mission is to bring positivity to families with children on the autism spectrum. Seeing firsthand how dogs can help children with autism and realizing that there was no organization doing this in MN, prompted them to start training dogs right away. Pawsitivity takes rescue dogs that need a new lease on life and trains them to be service dogs. About 1 out of 1000 dogs can be trained to be service dogs. They figure out, depending on the dog’s personality and energy level, which family the dog would be best fit. Service dogs have also been proven to help adults with severe depression or PTSD, among other disorders and disabilities . “If you have met one child with autism, you’ve met one child with autism” Tom says. Which is why they train each dog and family individually. They are a small organization, and they plan to stay that way. Tom and Julie know that the 900 hours they put into training each dog will meet their high standards, and the end result is astounding. Visit their website for the many heartwarming success stories Pawsitivity Service Dogs. Now through the entire month of August you can help raise awareness of these important dogs by donating to Pawsitivity, and in return Totally Kids will give you 10% OFF your entire purchase. All it takes is a $10 donation to save on anything storewide and online. We look forward to this new sponsorship and encourage everyone to help make a difference. 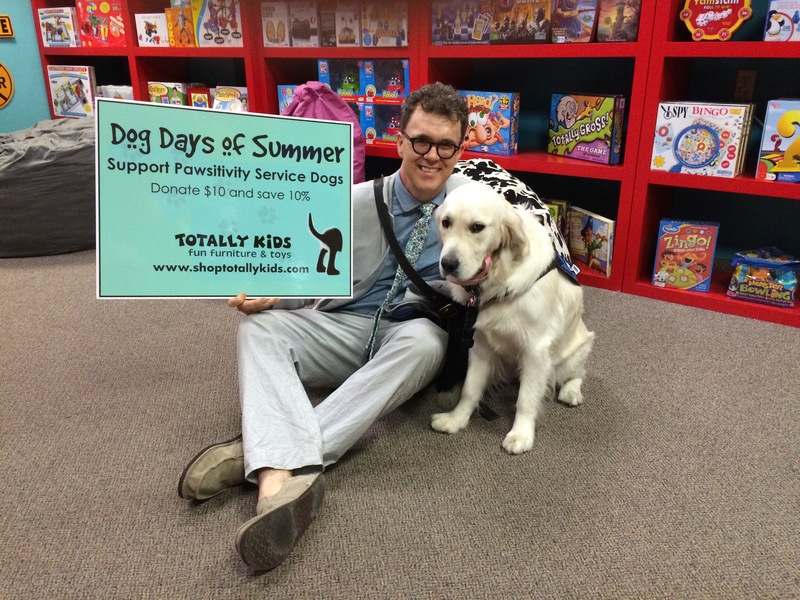 Totally Kids is proudly sponsoring Pawsitivity Service Dogs. We are an official sponsor for Pawsitivity Service Dogs of St. Paul, MN. Pawsitivity is an award-winning, donation-based, non-profit organization that focuses their efforts on training service dogs to assist children with special needs. Totally Kids will be pairing with the non-profit for the whole month of August, in an attempt to raise money for the organization. Come meet a service dog at Totally Kids Saturday, August 15th from 10am -12pm. The fun doesn’t stop there! All day Saturday, August 15th here will be treats, face painting, fun games and prizes. Now through the entire month of August you can help raise awareness of these important dogs by donating to Pawsitivity, and in return we will give you 10% OFF your entire purchase. All it takes is a $10 donation to save on anything storewide. We look forward to this new sponsorship and encourage everyone to help make a difference. Please join Totally Kids for the month of August to help out a great cause! 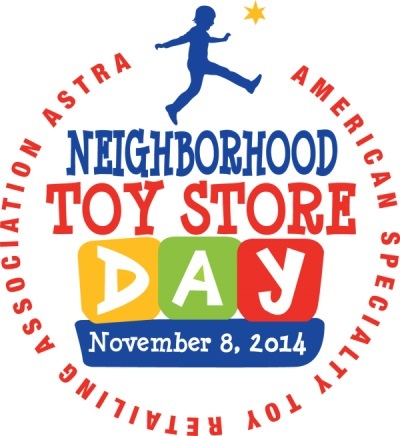 Join Totally Kids fun furniture & toys for a day of Family Fun on Saturday, November 8th as we celebrate National Neighborhood Toy Store Day. There will be so much to do, from trying out our favorite toys, games, winning contests and featuring face painting by Princess Christina! Play fun games and win prizes. Each child who donates a new or gently used toy for families economically challenged by the affects of Autism will receive 25% OFF their favorite toy or game. Register to win an Eco-friendly car, favorite toys and games, gift cards and a $500.00 SHOPPING SPREE! All Green Toys and Melissa & Doug Toys will be 20% OFF all day. 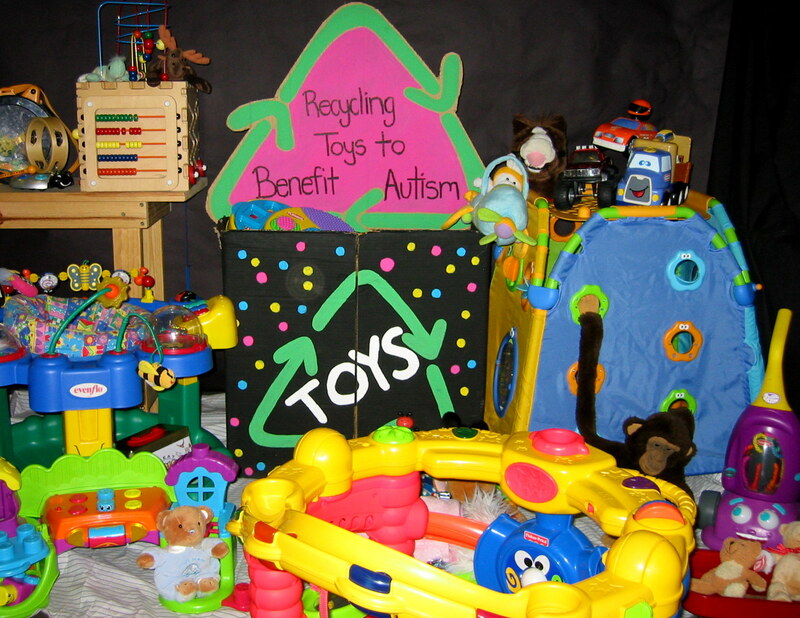 During Autism Awareness Month take advantage of this time to do some decluttering and organizing of your kiddos toys. This could be an excellent opportunity for teaching your children a lesson in sharing. Explain how happy some other children will be to receive the toys and how they will be new toys for the other children to play with. Tomorrow, April 2, is Autism Awareness Day. In many countries, April is Autism Awareness Month. With at least 1 in every 150 children now being diagnosed with Autism, awareness is important for every community. Learn how you can participate in and educate others about Autism. Become a Fan of World Autism Awareness Day on Facebook – invite your friends! Wilson Cook, a creative and talented 21-year-old with autism has a motto, “labels go on soup cans, autism is a diagnosis,” appearing on products ranging from jewelry to water bottles to license plates. Doth your playroom runneth over? You are not alone if you find yourself suffering the post holiday buried in toys syndrome. Take advantage of this time to do some decluttering and organizing of your kiddos toys. Make room for the newly acquired toys by playing a game of lining up and counting all of the new toys. Next have your child match each new toy up with one that is no longer being played with. An excellent opportunity for teaching your children a lesson in sharing exists here. Explain how happy some other children will be to receive the toys and how they will be new toys for the other children to play with.